B. Cory Kilvert has the distinction of having created one of the most disturbing comic strips of all time, Dorothy and the Killies, but that not our subject for today. No, today we have a pretty mainstream entry from Mr. Kilvert, Buddy Spilliken’s Diary. 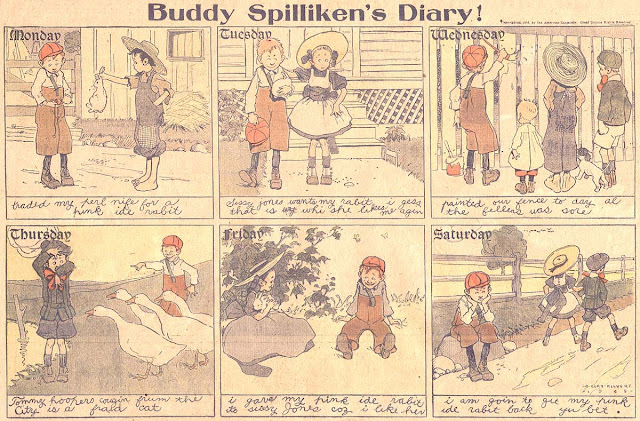 Buddy is a Tom Sawyer simulacrum, and in each strip we get a week’s worth of his scrawled diary entries. It’s very well executed but not the most memorable strip. Apparently the Hearst organization thought so little of it that they didn’t run it in the New York American‘s Sunday comics section, but only made it available to other papers as a replacement. That makes tracking it a bit of a challenge, but between the comic sections of the Los Angeles Examiner and San Francisco Examiner I think we have the complete running dates as October 11 to November 29 1908. It could have started on October 4, though — the LA Examiner microfilm is missing that section. 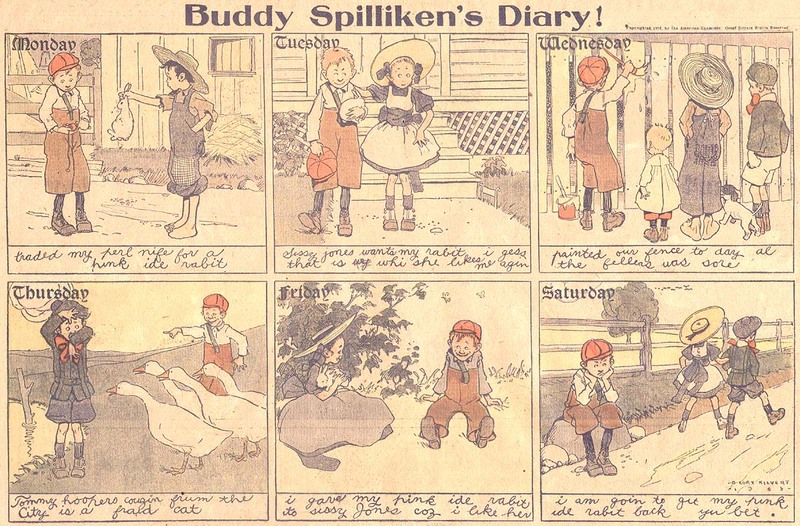 I wonder what the market would be like for some entrepreneur to take these old time newspaper comics and take the panels apart and reprint them large size into children’s books?